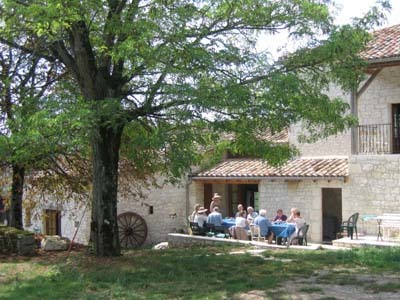 Betou is an ancient hamlet in a tiny valley midway between Bordeaux and Toulouse. It is peaceful and secluded. Its barns and farmhouses have beautiful views across the valley. There are acres of informal grounds with grassy terraces, a swimming pool, oak woods, pastures of wild flowers full of butterflies and walnut groves. Accommodation is in three converted old limestone farmhouses with tiled floors and oak-beamed ceilings. Most rooms have French windows giving their own access to outside terraces. Delicious food is provided by a resident chef. Breakfast and lunch are taken al fresco in the shade of an old barn. At dinner there is unlimited local wine, and candle light. For more details please email Sally at the address below.